You can order the Road Refresher right here, right now. Click here to place your order. We accept all major credit/debit cards. "The Road Refresher has reduced Blue's slobber and dribble by 90 percent. I wouldn't be without it." "The best water bowl ever, we use ours in the home and on the road." "This non spill dog bowl is amazing as my dog can drink in the back of the car as I drive and never spill a drop." "With the Road Refresher I know I can drive to where I need to go, down un made roads knowing that my dog has water throughout the journey and when we get to the other side he will still have a dry bed." "This non spill dog bowl is brilliant, he loves it, and so do we." Helen Warner, Farnham, Surrey, UK. "The Road Refresher bowl is the best water bowl on the market. We should know, we've tried them all!!" "Marvellous non spill water bowl - worth every penny - useful asset in any car or home - does exactly what it says." "Thanks to the Road Refresher I now have clean, dry floors in the home even though my dogs are two of the messiest drinkers around!!" "Toby uses his Road Refresher non spill water bowl while I am driving and when he is left in the car. He loves it and we never go anywhere without it." "The Road Refresher keeps our home clean and tidy as Fitch can no longer spit water all over the floor after his drink." "We keep our Road Refresher in the restaurant to avoid mess and spills." "I love these water bowls! Even with the way I drive, they still don't spill- now that's amazing." 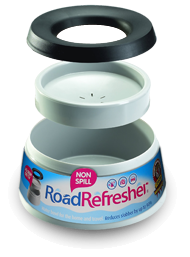 "The Road Refresher non spill water bowl is quite simply, the best thing since sliced bread."